Michael Kakadelis, known to generations of Lyric customers and to audiophiles around the world as Mike Kay, died on July 14th. He was 89 years old. Mike’s wife, Catherine, whom he married in 1958, died at age 85 on February 16th, just five months earlier. Catherine was Lyric’s indispensable head of office operations for decades. Mike and Catherine are survived by their son, Stratis, his wife, Regina, whom he met while both were enrolled in a post-graduate aerospace engineering program, and their daughters, Michelle and Christina. Mike was born on April 5, 1923, on the Greek island of Lesbos, also known as Mytilene, where his father was a grocery importer. At age 17, he was serving with a commando unit that fought Hitler’s forces in North Africa. After World War II, Mike earned a degree in electronic engineering in Athens, then signed on as a technician at the government radio network. He helped build the Radio Station of Athens, the nation’s largest, and was also involved in recording the country’s national orchestra, which was then under the baton of Dimitri Mitropoulos. In 1955, Mike emigrated to Canada, where he did manual labor in a brickyard, and washed dishes in a restaurant, while learning English. He subsequently went to work in an electronics store, where after just a few months his efforts were rewarded with a 25 percent share of the business. It wasn’t long before Mike moved to the United States, where he felt the economic climate would prove more bountiful. In 1959, he purchased a small, second-floor Manhattan hi-fi shop in which he had been working. His employer, a fellow Greek who had been badly injured in the civil disruptions that followed World War II in their native country, couldn’t keep pace with the work involved. Mike kept the shop’s name, Lyric, but after a while moved it to a more prominent, ground-floor location just a stone’s throw north on Lexington Avenue, where it later expanded, and where it remains to this day. In Mike’s early years at Lyric, he carried many of the brands that defined an industry devoted to better home-music reproduction: Fisher, Sherwood and Marantz electronics; Rek-O-Kut and Garrard turntables; Shure phono cartridges; and loudspeakers by Acoustic Research and KLH. Lyric’s main asset, however, was Mike himself. Mike set himself apart from other hi-fi dealers in another important way. He was closely involved with pioneering home-audio manufacturers, post-World-War-II era innovators as well as younger entrepreneurs who would ultimately be part of a thriving high end industry segment. From the outset, Mike maintained a cabinet shop, which allowed him to sell products to audio manufacturers as well as buying from them. 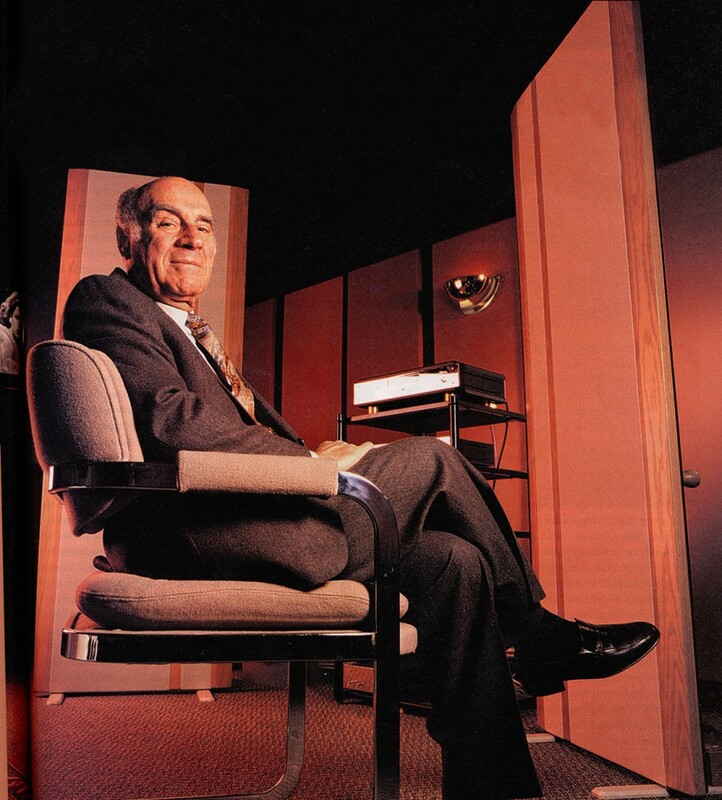 One was the legendary Saul Marantz, for whom Lyric built component cabinets. Lyric also built bases for Fairchild turntables, which were produced by Sherman Fairchild, the noted aviation, photography, and semiconductor inventor/entrepreneur. Fairchild was a serious hi-fi enthusiast, and he wanted a role in the business. The most distinguishing products turned out by Lyric’s four cabinet makers were elegant, handcrafted credenzas that housed many of the audio systems Mike recommended, sold, delivered to customers’ homes, then connected. They allowed his most discriminating patrons the convenience of one-stop shopping, and they helped make him one of the industry’s first custom installation specialists. As the high end audio movement crystallized in the 1960s and ’70s, Mike was at its vanguard, and he ultimately built Lyric into an internationally-known destination for serious home-music listeners near and far. As his reputation continued to grow, customers came from places as far afield as the Bahamas, Brazil, France, Italy, India, even Japan. So did high end audio designers, who knew that Mike would readily audition their prototypes and provide advice, not just about their sound but about various other factors that determine market viability. In 1982, Mike completed a project unprecedented in a retail audio store, the construction of four elaborately-designed listening rooms with acoustics superior to those of many recording studios. They took nine months to complete, cost upward of a half million dollars (1982 dollars! ), and remain as impressive as they were 30 years ago. That venture began when Mike secured an additional 3,000 square feet of space to expand Lyric’s Manhattan store. After consulting with an acoustician, he and his architect began devising solutions to problems as formidable as the Lexington Avenue subway, which runs beneath Lyric’s showrooms. To silence its noise and vibration, a 2.5-inch layer of heavy-impact fiberglass was laid on the building’s actual floor, and a reinforced concrete slab 3.5 inches thick that doesn’t touch the walls was poured on top of it. The walls are also unique. Two in each room are made of brick to reflect sound — irregularly-shaped used bricks were chosen for random reflectivity — and are treated with a special cork sealant that makes them airtight. Facing walls absorb sonic energy with insulating fiberglass placed behind wooden slats, which are separated from one another by a distance mathematically calculated for optimum sound. No two walls are parallel, because parallel walls create standing waves detrimental to music reproduction. Mike took little time off during his long career, but he truly loved what he did, and he continued to work the sales floor daily until he was in his eighties. In 2004, he passed the flag to his two key employees, Leonard Bellezza and Dan Mondoro, who own and operate Lyric today. By then, Mike Kay had become the elder statesman of high end audio retailing, a distinction that would not have been possible without his profound love of music and his steadfast commitment to components that reproduce it as faithfully as possible.